IA (イア) is a Japanese CeVIO Creative Studio voice bank developed and distributed by 1st PLACE | IA PROJECT. Her voice provider is Lia. During an interview, 1st Place's CEO stated that an English voicebank for IA was something they wanted to try. However, they wouldn't release it if they didn't think they were able to deliver high enough quality. In late June, a questionnaire titled "This is a questionnaire about virtual artist, IA. And Japanese Anime & Character culture" featured a question asking if the participant had used IA. This was then followed by a question asking if they would try her if there was an English version. On July 1, the English voicebank was revealed to be in development through a Weibo comment stack. A tweet also mentioned that IA English and a talking CeVIO Creative Studio voicebank were being developed. However, 1st Place later denied the claims of a CeVIO talk bank. They stated that they would only release the speaking voicebank if it was deemed high enough quality and that the engine was not confirmed. On March 10, 2018, 1st Place revealed a crossfade for an upcoming album called IA/04. Some of the songs featured IA singing in English, confirming a new bank in production. However, it was not clarified what voice synthesizer this voicebank was developed for. On March 11, Lia, IA's voice provider, acknowledged the new voicebank and tagged her post with "#englishvocaloid" which implied that this voicebank was to be developed for VOCALOID. On March 12, Lia later retracted her previous tweet regarding what voice synthesizer IA English was running on, noting that she was unable to announce any further information. 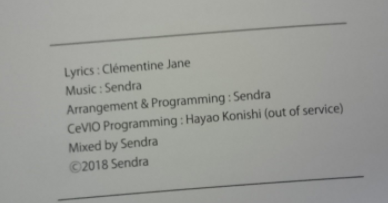 On March 28, it was found in the song credits for "Conqueror" that IA English was programmed for CeVIO. On June 22, it was revealed on 1st Place's website that IA English would be released under the name "IA ENGLISH C" for CeVIO 6.1 on June 29. It was also revealed that IA ENGLISH C would be released with two separate voices, "Natural" and "Powerful." IA is the first vocal in the "- ARIA ON THE PLANETES -" project. "IA" is taken from her voice provider's name, "Lia". The words "Aria" and "Planetes" are Latin and Greek for "open space" and "planet" respectively, giving the translation of "Open Space on the Planet". "Aria", is also the Italian word for "air" and is used as a term in opera for expressive pieces, usually sung by a single singer. This also fits in with her more opera-esque vocal results compared to other released Japanese VOCALOIDs. When she was first released, overseas fans often mistook "Aria" as the name of the VOCALOID. Her design was illustrated by Aka Akasaka (D. Z. ), while the design direction was by Maxilla Inc. It was decided that they would go for soft colours instead of Vivid ones. At the time, there was skepticism towards avoiding vivid colours as there was a fear of her not selling because of the softer tones. Lia herself wanted her to be cute and pretty and was satisfied the first time she was shown the artwork. Despite the myth of IA's age being 15, she has had no age assigned to her. This myth seems to originate from a section underneath the paragraph on IA about her provider Lia, wherein one of the first things mentioned was that Lia debuted in America at 15 years old. In IA 6th and ONE 3rd anniversary special talk live it was revealed that IA is 155 cm tall. IA; IA's Japanese VOCALOID3 Voicebanks; IA and IA ROCKS. ONE; is a vocal created for CeVIO able to talk as well as sing. She is the second vocal in the "- ARIA ON THE PLANETES -" project. "CeVIO IA" on Niconico Video. "CeVIO イア" on Niconico Video. The poll was created at 12:37 on January 28, 2017, and so far 210 people voted. What characteristic of IA do you like? The poll was created at 01:10 on January 19, 2019, and so far 33 people voted. ↑ Credits for the IA English song "Conqueror"